Markets saw significant upside yesterday, with continued strength this morning. Crude oil gained over a dollar yesterday thanks to three factors propelling oil markets. 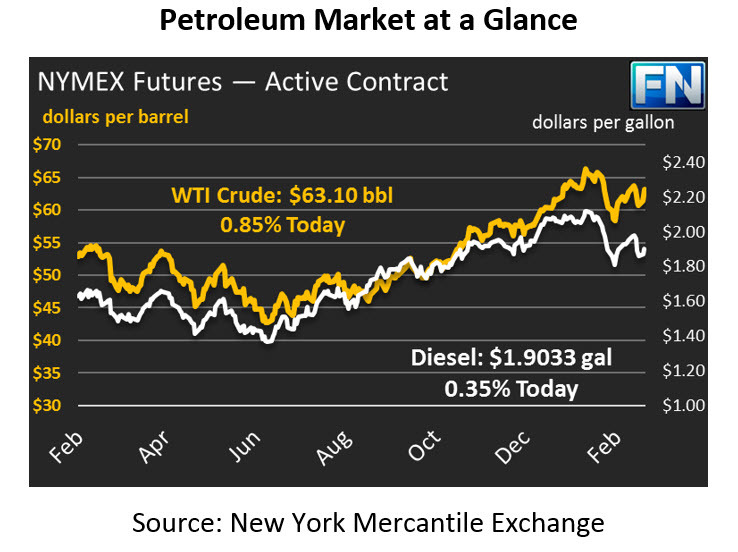 Today, crude prices are still rising, trading at $63.10, a gain of 53 cents (0.9%). Gasoline also saw strong growth yesterday with a 2-cent gain (+1%), though diesel prices remained flat. Today, both fuel products are trending higher. Gasoline prices are $1.9407, a half-cent gain. Diesel prices, which have been cheaper than gasoline prices since March 1, are currently at $1.9033, a gain of 0.7 cents. What are the three factors that caused markets to rise yesterday? Recently, analysts have heralded the connection between oil prices and equities prices. Oil generally does not correlate with equities markets. Recently, however, both have tended to rise and fall in sync, thanks to growing focus on the U.S. Dollar and interest rates. Low interest rates have helped prop up the stock market by giving investors liquidity to borrow and invest; at the same time, low interest rates have kept the dollar weak, giving strength to commodities like oil. With the economy booming, markets are fearful that the Federal Reserve could begin quickly and systematically increasing interest rates, which would send both markets lower. The linkage has caused oil investors to track equities markets more closely, so yesterday’s 1.4% gains in the Dow Jones Industrial Average gave support to crude prices. The IEA released their monthly report on oil markets, indicating that global demand for oil would remain robust through 2023. Of course, countering those claims were notes that U.S. production would “put its stamp on global oil markets” by accounting for 80% of global supply growth through 2020. The overall consensus in the report was that markets are balanced, but OPEC will have to work hard to maintain that balance over the next few years. The IEA noted that OPEC would need to extend its cuts for several more years to ensure markets do not tip back towards a supply glut. Yes, a dinner date between OPEC dignitaries and U.S. shale producers was the final reason the markets rallied yesterday. U.S. shale producers are gathered this week at CERAWeek, an industry gathering in Houston attracting oil producers from across the country. OPEC representatives attend the meeting as well, and as in years past, OPEC producers spoke to American producers at a dinner during the conference. OPEC’s Secretary General Mohammed Barkindo reportedly called on shale producers to keep prices at their current levels, while Nigeria’s oil minister noted that both OPEC producers and shale producers are responsible for maintaining steady oil prices. Fears of collusion can be set aside. While the dinner attracts significant media attention, OPEC has no sway over private companies in the U.S. to join their cuts – private companies are beholden to stockholders and investors, who prefer market share over austerity. SHALE: Why? We have nothing to talk about! OPEC: Yeah, we know. But just the rumor we are eating together will cause idiots to bid oil up. At least a buck of upside, which helps both of us. SHALE: Done deal. Steak or seafood?